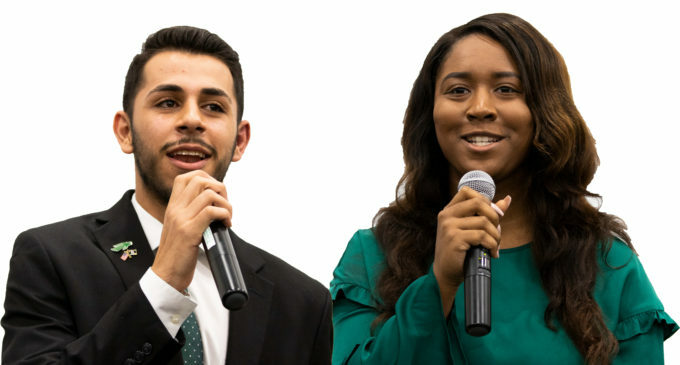 Muhammad Kara and Dominique Thomas won the Student Government Association spring 2018 election for president and vice president with 53 percent of the vote, according to the SGA Election Certification Addendum. Students cast 1,897 votes during these elections compared to 2,809 votes cast in 2017. Kara and Thomas are currently the SGA chief of staff and president of the Black Student Union respectively. Results were intended to be published Friday but were withheld pending a Supreme Court case appeal. Kara and Thomas ran against SGA Senator Misaki Collins and Ipinowula “Ipi” Adedokun, the head manager for UNT’s Women’s Basketball team. The Supreme Court unanimously ruled that Kara and Thomas violated the Election Code by publicizing their campaign before the date approved by the Election Board. Collins filed the Supreme Court case on April 12. The court ruled 5-1 that one vote would be removed from the Kara and Thomas ticket. Delaney Sell, an individual who tabled for Collins and Adedokun, filed a complaint against freshman Victoria Edwards for selling Gatorade at a tabling event for Kara and Thomas. The Election Board unanimously decided no bylaws were violated because Kara and Thomas were approved by the appropriate university departments to give out Gatorade at their tabling. They said those departments “failed to realize that Gatorade is a Pepsi product,” as UNT is a Coca-Cola product school. Campaigning began on April 3. Candidates campaigned using tabling, social media and other platforms. Kara and Thomas’ platform focused on transparency, outreach and projects. They were supported by UNT’s chapter of the NAACP, UNT’s chapter of the National Association of Black Journalists (NABJ) and the Black Out Alliance. “This could not have happened without [UNT students], without a new spirit of inclusivity, a new spirit of unity,” Kara said. Students voted yes by 88 percent to authorize SGA to update its constitution to include more gender inclusive language. Any changes to the SGA Constitution must be approved by students through a referendum. The resolution was submitted to the SGA Senate by Collins and two SGA interns, Hanlyn Tyler and Taylor Diaz. Voter participation in 2018 decreased from 2017. About 5 percent of the student population voted during 2018 elections compared to 8 percent in 2017. The 1,897 votes represent 6.6 percent of the undergraduate population. New senators will be sworn in April 18. Kara and Thomas’ term begins June 1. Julian Esparza contributed to this report.